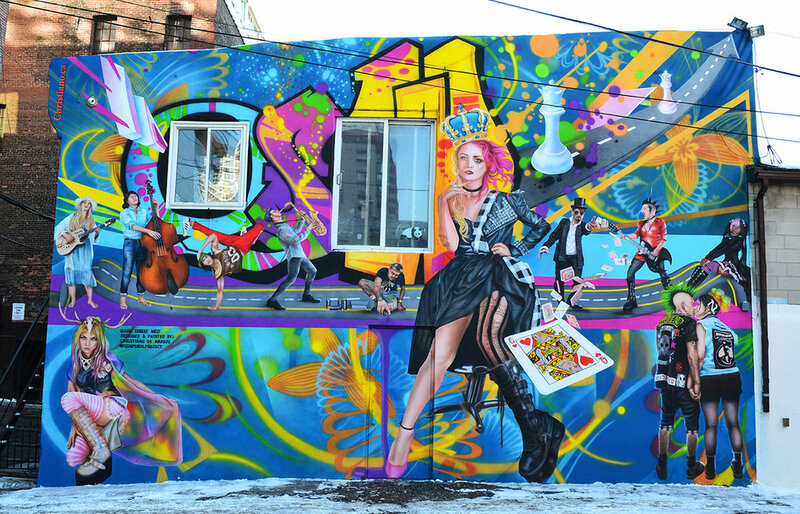 Mural art illuminates buildings, alleys, and public spaces in Toronto. They are unique in their ability to engage communities by storytelling, portraying messages and honouring remarkable people through vibrant paintings. Mural artist Christiano De Araujo and his company have completed several eye-catching murals around the city. His most recent one tells the history and culture of Queen Street West. It consists of real artists, musicians, buskers, and others who have performed on the street. De Araujo said the great part about mural artists having their work displayed in public is the attention they receive from bystanders. Those who take and post pictures, ask questions and compliment their work also promote it. Adrian Hayles, mural artist and painter, said he enjoys the community engagement process where he gets to have open discussions with clients about what they want him to paint. He says that it gives him insight for coming up with sketches, colour concepts and feedback from the community. “Those discussions force me out of my box and allow for extraordinary creative possibilities,” Hayles said. 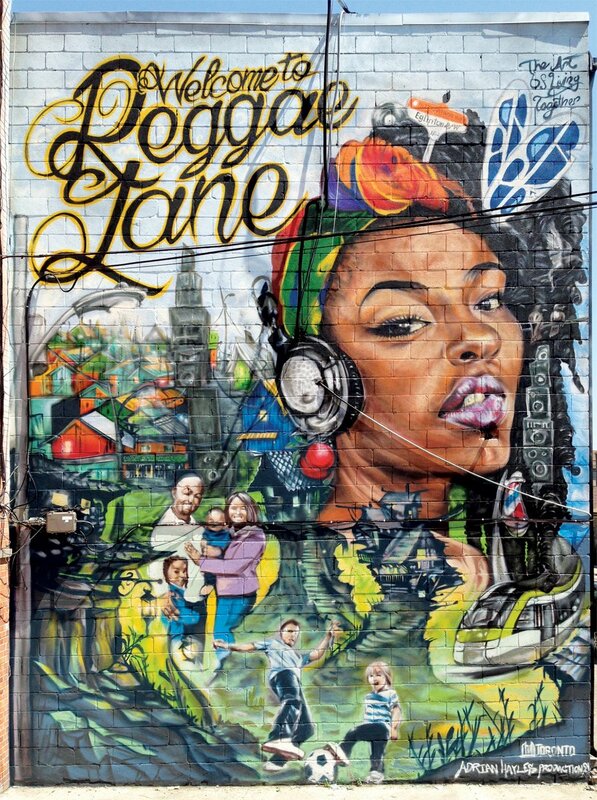 Standing twenty feet tall and one-hundred feet wide, Reggae Lane is a mural at Eglinton and Oakwood avenues that Hayles takes immense pride in. It features Canadian Reggae legends from that community. Hayles emphasizes his love for the production process and how close it was to the heart of the community. “The fact that we get to help shape communities by telling their stories and creating pieces that hopefully outlast us is very special,” said Hayles. Like Hayles and De Araujo, artist Nick Sweetman has also completed projects that engage the community. He has partnered with StreetART Toronto, youth groups and other painters to create vibrant paintings and community engaging mural projects. For one particular work, he created a monumental-sized mural with STEPS Initiative, titled “In Our Hands.” Working with a group of emerging high-school artists, they were able to complete a series of four pieces on the outside of Valley Park Middle School in Don Mills. “It was a really rewarding experience working with girls who had never done a ton of art, let alone paint a huge mural … we really bonded,” Sweetman said. Sweetman is also proud of a wall that was dedicated to a friend who passed away in September 2017. The project was originally started by himself and another artist, but it soon evolved into a bigger community project, bringing more people involved. “We took up an entrance of graffiti alley (in downtown Toronto) and made the mural super tall so he’s looking down,” said Sweetman. In the early stages of his career, Sweetman was proactive in chasing jobs. Now, after gaining recognition and partnerships from past clients, he has the jobs coming to him. Sweetman says he has always kept three main principles in his mind; First to be a nice person, second, to deliver on his word and third to work extremely hard on every project. “Potentially everything you make is the first and possibly only thing that someone will see, so you might as well make it kickass,” Sweetman said.